The next iPhone is highly awaited, as this is the year for the redesign and as always there are lots of rumors surrounding the next iPhone. Here’s another one, we have come to know about some of the specs of iPhone 6 or iPhone Air or whatever Apple plans on calling it. 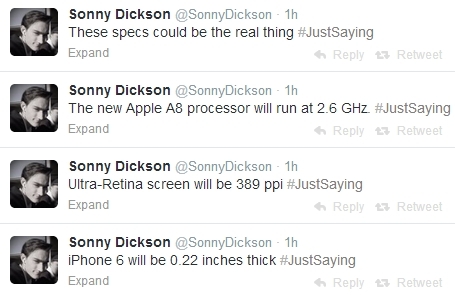 These specs comes from an Apple insider Sonny Dickson. He has proven to be reliable in the past but we would still suggest you to take this rumor with a slight pinch of salt. According to him, the next-gen iPhone will be 0.20 inches thick, which means 5.5 mm. Now, that sounds pretty crazy thin. He also says the device will feature a display of 389 ppi, which he calls Ultra-Retina display. The next iPhone is rumored to come with a 4.7-inch display and for a 4.7-inch display to have 389ppi, the resolution will have to be somewhere in between HD (1280×720) and Full HD (1920×1080). He also mentions about a 2.26GHz Apple A8 chipset powering the device. Along with these specs, he also tweeted, “these specs could be the real thing”, which means these specs could also prove to be wrong. With the 4.7-inch iPhone 6, there is also the rumored 5.7-inch display packing iPhone 6 phablet, which will supposedly look similar to the iPhone 5c. There will be iOS 8 on board. We are certainly awaiting the next iPhone, considering many of us have always wanted an iPhone with a bigger display. Until we get to see the real iPhone 6, you can feast your eyes with this lovely concept of iPhone 6.